Welcome to the ramblings of a slightly skewed brain. Perhaps this can be ascribed to the far different climates where I've lived. In one state it can dip to 30 degrees below zero. Two places where I have lived can register 118 degrees or higher. I'll take the latter anyday. I was born in Lincoln Township, Audubon, Iowa. Yes, people still refer to the townships there. One of the neatest web sites is David Kusel. If you are curious about rural life in these United States, just type in his name. I recommend a look. I started writing for the Audubon Advocate (Audubon, Iowa) when I was 13. The pay wasn't much for the work involved, but I loved it. My writing continued off and on for years. Children prompted me to invent a bedtime story as my father had done. That was sold to a children's magazine. Then I went to work and writing took a back burner until we moved from Arizona to Western Washington. Do you know that it can rain 133 1/3 inches in one year? Not only can it do that, it does. When I returned to work in Washington, I found the greatest employer imaginable. Nintendo of America paid me to talk, read, write, and play games. It was intense at times, but truly enjoyable. 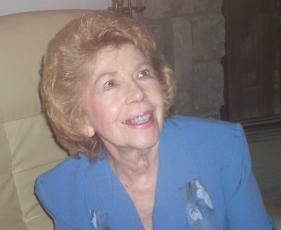 My husband and I returned to the desert in 2001 and I found myself at loose ends. Now I'm writing and involved with the greatest little museum in the world. Take a look at www.29palmshistorical.com. How many museums would have a Weed Show? To top that, they have an Old Schoolhouse Journal for which I write two columns. To ease the solitude of writing, I joined the Desert Writers Guild of Twentynine Palms. Our membership fluctuates between eight and twelve, but each year we publish an annual of over 100 pages. 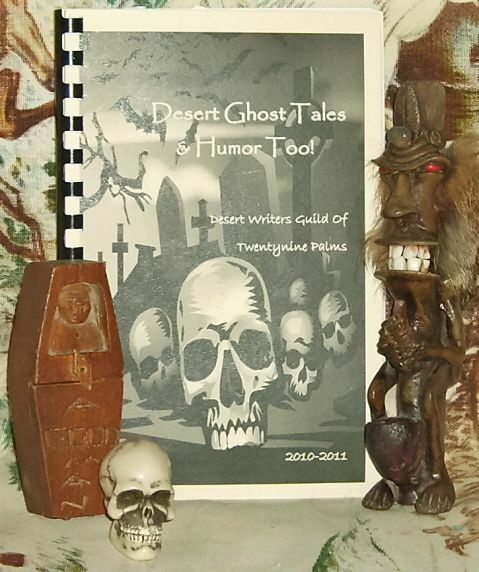 Our latest one is entitled Desert Ghosts & Humor Too. It's a perfect gift for Halloween or for those dark stormy nights and a cozy fire. It's over 100 pages of chills and laughter. If you're interested link to http://thebookspirit.com or use my Contact Me link. This is the cover of our new Desert Ghosts & Humor Too! Twentynine Palms is often referred to as the gateway to Joshua Tree National Park, but it is more; so very much more. The desert's beauty can often take one's breath away when spring flowers are painted against the mountainside, when sunrises and sunsets almost blind the eye with their brilliant colors, or when rocks seem to change into strange forms when shadows, sun, or night work their transforming magic. The surrounding desert is filled with artists, writers, and musicians. If you want proof start counting the number of art galleries between Wonder Valley and Morongo Valley, the eastern and western settlements of the Morongo Basin. There are museums, theatres (two), and awesome night skies still filled with stars. 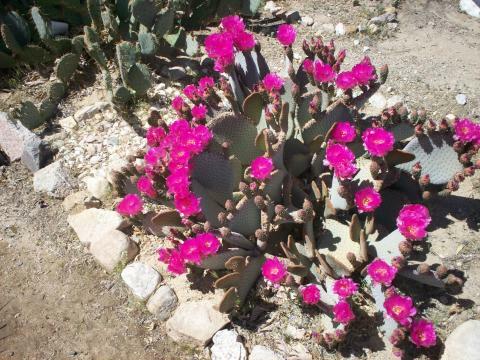 Here's a photo of a beavertail cactus. There are also yellow and peach flowering ones in my garden.